White biryani is a new and different type of biryani sans tomatoes and chillies. 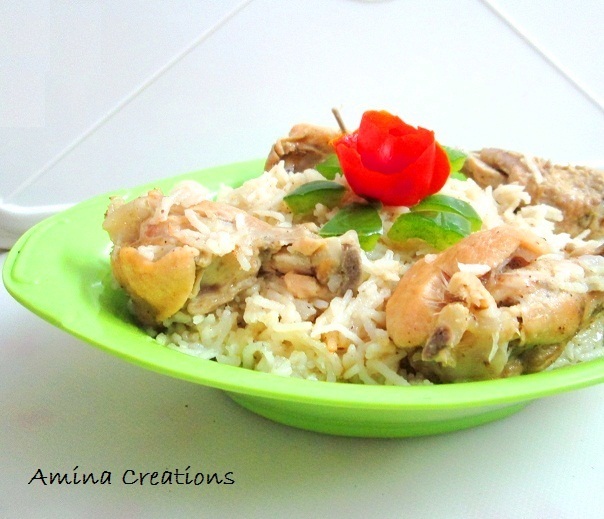 It is the presence of white pepper that adds a wonderful taste, flavour and aroma to the biryani. Add the chicken, coat well with the mix and set aside for at least half an hour. Now heat a pressure cooker and add oil. Add cardamom, cinnamon and onions and saute till the onions turn golden. Next add ginger garlic paste and saute till the raw smell goes. Add pepper powder, salt and the chicken along with the marinade and mix well. Add lemon juice and 2 cups of water and bring to a boil. Now add the basmati rice (that has been washed and soaked in water for half an hour and then drained) and mix well. Garnish with Coriander and mint leaves and serve hot. This sounds really interesting... bookmarked!